As a young man, I worked at KSAN. Like the singer sang all of those years ago, “Don’t it always seem to go, you don’t know what you’ve got ‘till it’s gone”. Now when you are 22 and working for a small radio station in Wisconsin, that seemed like an offer. It was about 4 o’clock in the afternoon, as the 18-foot U-haul truck I had driven over 2,000 miles finally lumbered its way into San Francisco. The radio was blasting “Fresh Air” by Quicksilver. Life can imitate art. Everything I owned including the 1967 red Volkswagen was in the back of that truck, swaying every time I turned a corner, or when I went up or down one of The City’s famous hills. The engine had blown a rod near Salt Lake City and it was cheaper to rent a U-Haul truck than it was to get the engine fixed. 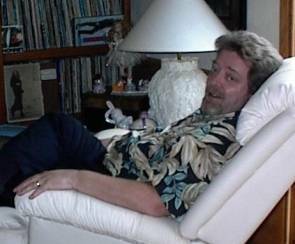 I actually parallel parked on Bush Street near China town and got a room at a fleabag apartment…The next day I went to KSAN, and asked for Thom O’Hair. When he came out into the reception area, he seemed a bit shocked that I actually drove all of that way after the letter he had written to me. He said something like, well let's go for a ride. So we hopped into a cab and went over by Golden Gate Park to a house just on the border of the park. About two hours later, Thom said he would call me. He stood up and left me there! So I walked back to Bush Street, probably bouncing off a few walls and doorways, but it definitely was a wonderful stroll. 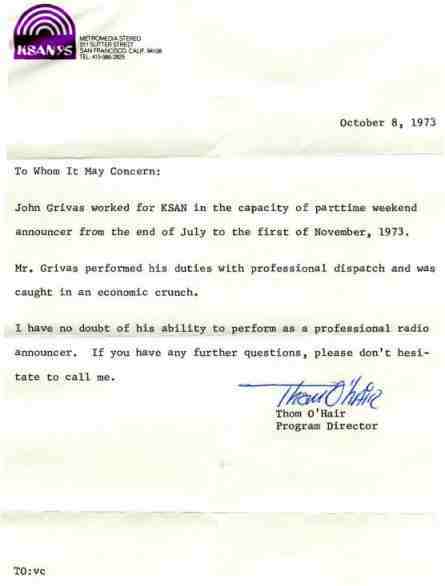 About a week later Thom O’Hair called and said that I could start working the overnight shift, filling in for Norman, who was going on vacation. I left the employment agency and went to KSAN. But when he and the rest of the staff saw me, it was like I was from another planet because my hair was so short...he didn't recognize me...but I started to work and it was a great time...although I did find irony in some of the staff’s opinions of me, because of my hair. It was after all just hair, which was the premise of growing it long in the first place, right? O'Hair didn't allow me to use my own name for some reason. He gave me the choice of "Tony Pig," which he told me had been used before, but some time had passed and it would be okay to use it again or "Johnny Garbage." Not wanting to confuse the confused, I went with the Garbage name although I hated it. But I remember Bonnie Simmons, Raechel, Dusty, Norman, and the Big Daddy himself, as being very kind and nurturing to me. Then the energy crisis of 73 hit (can't remember exactly, it was after all, a haze...), and they cut back some of their staff, so I was out. I went to work for the Archdiocesan Communications Center of San Francisco. We were like the public relations department for the Catholic church...creating movies for the schools and commercials for the Campaign For Human Development. They also rented out their space for other "spiritual" events...I used to do the sound for the Isadora Duncan Dancers when they did a performance, and the Buddhists. From there, I went on to work at KOME, KSFM, KPRI, and 91X in California, and also at WQFM, WZMF, and WLPX, all in Milwaukee. 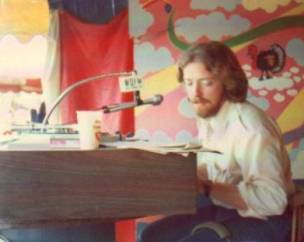 I teamed up with another person and we did a morning show, “John and Mary” at WQFM, then KSFM, KPRI, and 91X. At 91X, which was a 100,000 watt station beaming out from the largest hill in Tijuana, I signed it on the air with the Airplane’s “Volunteers of America” from the Woodstock album. Yes those days in radio were very magical. We were usually hired based on our musical knowledge and how we would put musical sets together, and how we communicated. We could create a mood or tell a story with a music set. It was a beautiful thing going from a Joni Mitchell or Ry Cooder or J.J. Cayle song into something by The Stones, The Kinks, Van Morrison, or B.B. King, and then finishing the set with The Tubes, The Sons of Champlin, Tower of Power, or Lou Reed. In those days we started with a blank canvas and could paint the picture using any color. Then they changed it to painting by numbers in the late 70's, with play lists that told us what to play and when to play it. It went from an abstract painting to a juke box. Somehow we all, and I mean those of us on the radio and those of us listening to the radio let this get away from us. Back in the early days, Jimi Hendrix and the whole music genre was called "underground music", then through the years it became known as "progressive", "contemporary", and "adult contemporary". Now it is known as "classic oldies". But life goes on, and those of us who were there, on either side of the radio speakers, will never forget how magical those times were. For the past 22 years I have been in the promotional products industry here in Wisconsin (Yes, you CAN go home), selling promotional branded products (pens, caps, clothing, etc. ), premiums, and incentives for marketing programs, internet company stores, and mass mailing projects for major corporations.